This recipe will make 4 large servings as a main meal. We usually cook the roasted cabbage in a large baking dish in our microwave oven (on high), but it can also be baked in a conventional oven at 350 degrees F.
Begin by washing and cleaning the veggies, and peeling the onions and carrots. 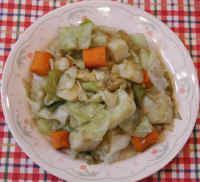 Slice and cut the cabbage into bite-sized pieces and place in the baking dish. Sprinkle on the Bell's seasoning and mix well. 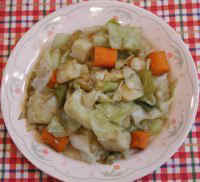 Cut the carrots into bit-sized pieces and add to the cabbage. Coarsely dice the onions, add to the cabbage, and mix well. Cover the baking dish and cook until the veggies are tender, mixing occasionally to ensure that the veggies are uniformly cooked.